This mug is the perfect gift for anyone fabulous you know who's expecting. 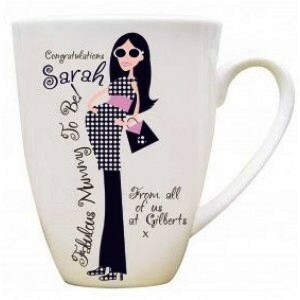 The mug features a fabulous female illustration and is personalised with a name and also a message on the front up to 50 characters. A fine bone china mug 10.5 cm high x 11.5 cm wide. The perfect gift for the Yummy Mummy To Be In Your Life. Please enter Mum's name along with the personalised message (maximum 50 characters including spaces) into the text box below. Please allow 7-10 working days (UK ONLY) from placing your order for production & delivery of your personalised gift.